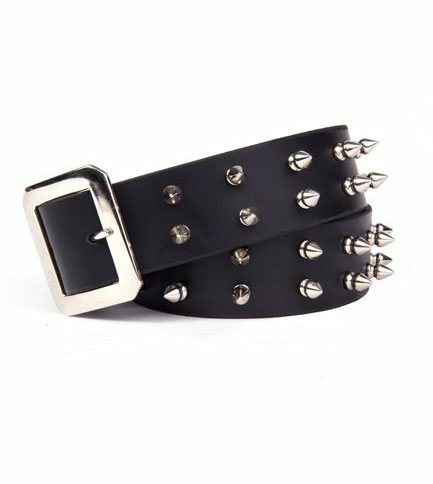 Black leather belt made from 100% real leather with two rows of tree spikes and a detachable belt buckle. Made in the US. This is a great belt. Nice and thick and yet supple and easily able to thread through belt loops. The spikes are riveted on and the rivet heads are recessed and do not snag on clothing (or skin). The buckle is plain and elegant and replaceable with a snap. A perfect match for my spiked wristbands and collar!